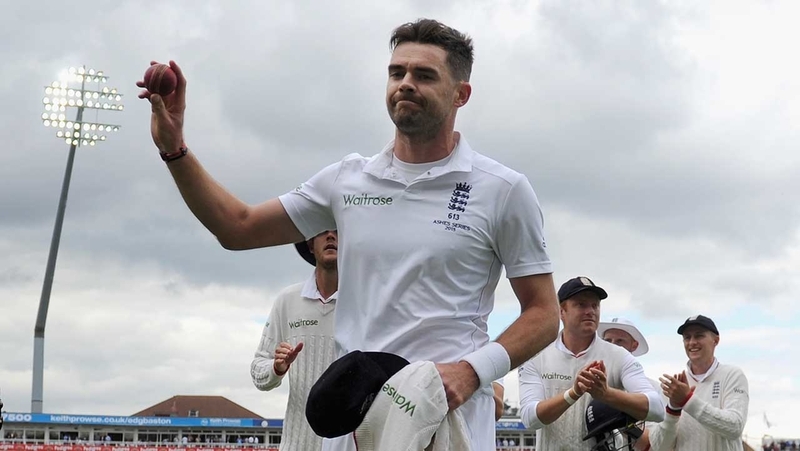 James Anderson claimed his career-best Ashes figures as England bowled Australia out for 136 on day one of the Third Investec Test Match at Edgbaston. Anderson took 6-47, while Nottinghamshire’s Stuart Broad and the recalled Steven Finn claimed two wickets apiece, as the visitors were all out in 37 overs after winning the toss and electing to bat. England sped to within three runs of their visitors by the close for the loss of three wickets – a brace of dismissals to off-spinner Nathan Lyon having kept Australia in the hunt. There was drama from the second ball of the match in-front of 25,000 supporters in the second city as Chris Rogers took off for a nervous single and David Warner was slow to respond. Broad expertly threw down the stumps, but the Aussie left-hander was saved by his full length dive. Rogers quickly gathered composure and went on to score a half-century, but the former Derbyshire, Leicestershire and Middlesex man was powerless to stop the wickets tumbling at the other end. Anderson trapped Warner lbw and, after a probing but unsuccessful opening spell from Broad, Finn took centre-stage with the prized double scalp of Steven Smith, caught behind, and Michael Clarke, who was clean bowled. Voges and Rogers added 43 and took the score to 77-3 shortly after the lunch interval, but that was when Anderson began to do serious damage. Voges nicked off to Jos Buttler attempting to leave, Mitchell Marsh was also caught behind and Peter Nevill, preferred to the now available Brad Haddin, shouldered arms and lost his off-stump. Mitchell Johnson was caught by Ben Stokes, low down at gully, to complete Anderson’s five-fer. And, although 37-year-old Rogers continued to be England’s nemesis by scoring 52 off 89 balls, he was plumb lbw to Broad, leaving Australia 110-8. Broad grabbed a second wicket of the innings as Mitchell Starc was caught behind by Buttler, before Lyon played on as Anderson snared his sixth of the innings. England’s reply lost Adam Lyth early to a flat-footed drive at Josh Hazlewood but, batting in his new position of number three, hometown hero Ian Bell batted fluently in partnership with Alistair Cook as the pair took the score to 76. Cook was unlucky to be caught by a none-the-wiser Voges at short-leg having laced one out of the middle of the bat. Bell became Lyon’s second dismissal of the day, caught at midwicket shortly after posting a half-century, leaving Joe Root unbeaten on 30 at the close.